Found 3 file extension associations related to Perl Data Language and 3 file formats developed specifically for use with Perl Data Language. Perl Data Language (PDL) is a set of Array programming extensions to the Perl programming language. 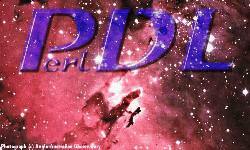 PDL is an extension to Perl v5, intended for scientific and other data intensive programming tasks. Perl's data structures are intended for small to medium sized analysis tasks - they embody simple data structures and include considerable behind-the-scenes magic for type conversion, variable size, and the like. Numerical tasks such as image processing and computer modeling of physical systems require more structured data, and PDL supplies this need by including more traditional array constructs and additional syntax to describe vector processes. If you need more information please contact the developers of Perl Data Language, or check out their product website.